Looking for the right K20? This one has to be it. This documented 2 owner western truck just received its first ever repaint at a cost of over $20,000. It retains nearly all of its original sheet metal, including the fenders, doors, rocker panels, cab corners, box sides, cowl, hood, etc. The body is laser straight with phenomenal paint and all new rubber seals, trim, door handles, etc. 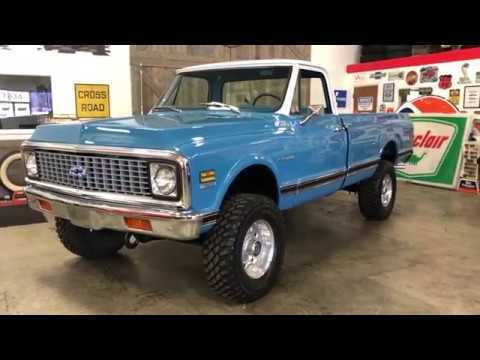 The truck was sold new at John Koich Chevrolet in Independence Oregon on 10-6-1971 and the original dealership license plate surround is included with the purchase of the truck. The new owner will also receive the Protect-O-Plate, warranty book, owners manuals, original emission control systems book and ownership docs from first owner showing ownership until 2014 where it was sold to the second owner that we received the truck from. This truck never left its hometown prior to arriving at our dealership. Trucks like this do not become available often and this one is the best example we have had the privilege of owning with this type of history and documentation. During the recent repaint, the truck was fully disassembled. The interior of the cab, steering column, dash and cab floor were painted. The entire truck was taken down to bare metal and refinished in its original white/medium blue colors. The truck runs and drives fantastic. There will be no disappointments with this one!